NordicTrack T17.2 Treadmill comes with an incredible frame that has a dualflex cushioning running deck and offers a superb enjury free workout. It is driven by a 4.5 HP motor, having a maximum speed of 22 kmph. For a more intense workout it can inclined maximum upto 15%. The T17.2 is compatible with both iFit Live* and Nike + iPod. iFit Live ensures users a smarter workouts, Powered by GoogleMaps. It supports upto 32 inbuilt workout programmes, that supports every kind of users. Besides the treadmill is also loaded with many other attractive features like Quick-Touch handle controls, auto breeze fans, iPod compatible and many more. *Note: Most of the sites, stores or shopping portals listed above sell NordicTrack T17.2 Treadmill with discounts and other exciting offers. There is a possibility that the some of above websites are not selling NordicTrack T17.2 Treadmill now. Toughtrain.com is not liable for such cases or instances. 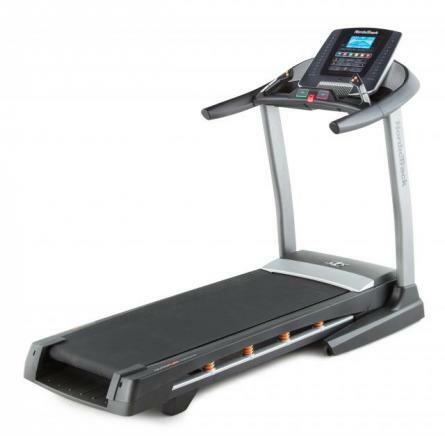 Also we do not recommend any seller for NordicTrack T17.2 Treadmill and a buyer should buy from where he/she gets best deal with quality of products, service and on time delivery (shipment).